It looks like we have finally isolated one of the Ugi products we have been trying to make for a while. After analyzing the failed reactions and the kinetics of each step, we learned to stop using unstable aldehydes (like phenylacetaldehyde) and isonitriles (like 2-morpholinoethyl isonitrile). 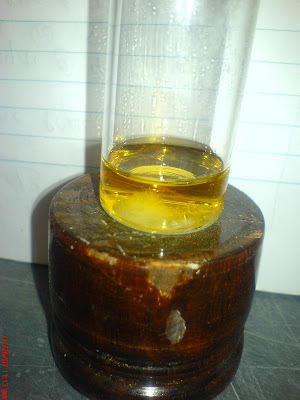 It was then simply a question of mixing an amine (5-methylfurfurylamine) and aldehyde (piperonal) that we know cleanly form an imine in methanol then adding the carboxylic acid (boc-glycine) and isonitrile (t-butyl isonitrile) and waiting long enough to watch the crystals form. 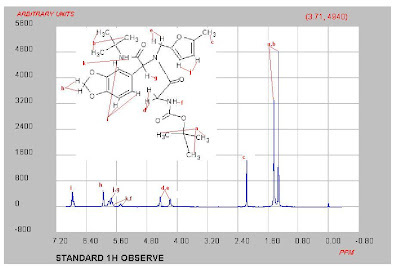 Alicia was first (EXP052) to isolate and characterize her crystals by H NMR - see the assignment below. The tricky part was that one of the amide H's and the benzylic H were overlapping with the furan H's. Exchanging the amide H's with methanol-d4 made the assignment pretty clear.